Engineers from Princeton Plasma Physics Laboratory in Plainsboro, New Jersey and agricultural scientists from the U.S. Department of Agriculture research lab in Wyndmoor, Pennsylvania developed a process and device for pastuerizing eggs in the shell without damaging the delicate egg white. The team inventing the process filed for a patent and is seeking licensees to take the process and device to market. The Princeton Lab, a national laboratory managed by the university for the Department of Energy, conducts research on radio frequency (RF) physics for fusion energy. Engineer Chris Brunkhorst at Princeton Lab applied principles of RF energy to the problem of ensuring the safety of eggs from salmonella bacteria, a problem with limited occurrences, but with the potential for serious public health consequences from eating raw or undercooked eggs. USDA estimates pasteurizing eggs in the shell could reduce the number of salmonella cases from eggs by 85 percent, which translates into more than 110,000 cases per year. Hazards from salmonella-tainted eggs would most affect people with compromised immune systems, such as infants, elderly, and hospital patients. While federal food safety regulations require pasteurization of raw liquid egg products in processed food products, such as eggnog and dressings, no such requirements are imposed on eggs in the shell. 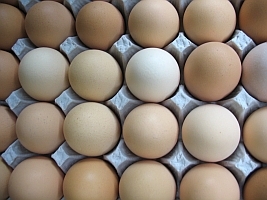 USDA’s Food Safety and Inspection Service estimates less than 0.5 percent of all shell eggs are pasteurized. Brunkhorst, with USDA scientist David Geveke and technician Andrew Bigley, had to find of way of raising the temperature of eggs high enough to kill bacteria, but not so high that it cooks the egg and damages the egg white. Their device harnesses RF energy that transmits heat through the shell of a rotating egg, while cool water flows over the egg protecting the white. A hot water bath then finishes pasteurizing the yolk and pasteurizes the white. USDA built a prototype device about the size of a shoe box based on the team’s research that performs the pasteurization process. Rollers in the device rotate the eggs, while the RF energy is transmitted from electrodes and water bathes the egg. The RF energy uses a process known as ohmic heating, where the food acts as a resistor, and the energy passing through is dissipated into heat. Ohmic heating is usually rapid and uniform, but less likely to damage the food than conventional thermal heating. The process developed by the team takes about 20 minutes, one-third as long as the hour needed for conventional pasteurization methods. But the Princeton Lab/USDA process, say the inventors, maintains the transparency of the egg white, while conventional methods change the white’s appearance. USDA is seeking licensees from industry to commercialize the team’s invention. Candidates include egg producers and manufacturers of egg processing equipment. Geveke says the device generated a good deal of interest from industry and they expect to have a partner in a few months.